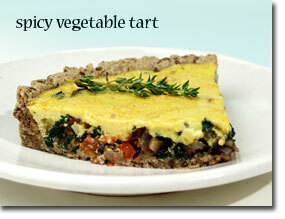 Enjoy the wealth of nutrients in this unique tart, which is a wonderful treat when you have a little extra time to prepare your meal. Soak flax seeds in 1/4 cup water for 10 minutes. While flax seeds are soaking, grind rest of crust ingredients in food processor. It should be finely ground when done. Add flax seeds and soaking water to crust ingredients and continue to process for another 30 seconds. Press evenly into a 9-inch tart pan making sure you come up to the top edge so crust isnï¿½t too thick on the bottom. Bake crust in oven for 15 minutes. While crust is baking, chop onion and garlic and let sit for 5 minutes to bring out their hidden health benefits. Bring lightly salted water to a boil. Cook chopped chard for about 3 minutes in boiling water and drain. This will reduce oxalic acid from chard and make it sweeter. Heat 1 TBS broth in a medium stainless steel skillet. Healthy Sautï¿½ minced onion, garlic, and mushrooms in broth for 5 minutes stirring frequently. Add herbs, tomatoes, salt and pepper, and sautï¿½ for 2 minutes. Press out excess water from chard and add to rest of vegetables. Remove from heat and spread evenly over crust in tart shell. Blend egg whites, silken tofu, turmeric, and a little salt and pepper in blender. Pour evenly over vegetables and bake for another 25 minutes. With the tip of a knife loosen around edges of crust and remove ring. Cut into wedges and serve.